Dianne and Mark had been searching for a new dining table with a specific range of layouts, but had failed to find something ready-made that they really liked and that was perfect for their situation. 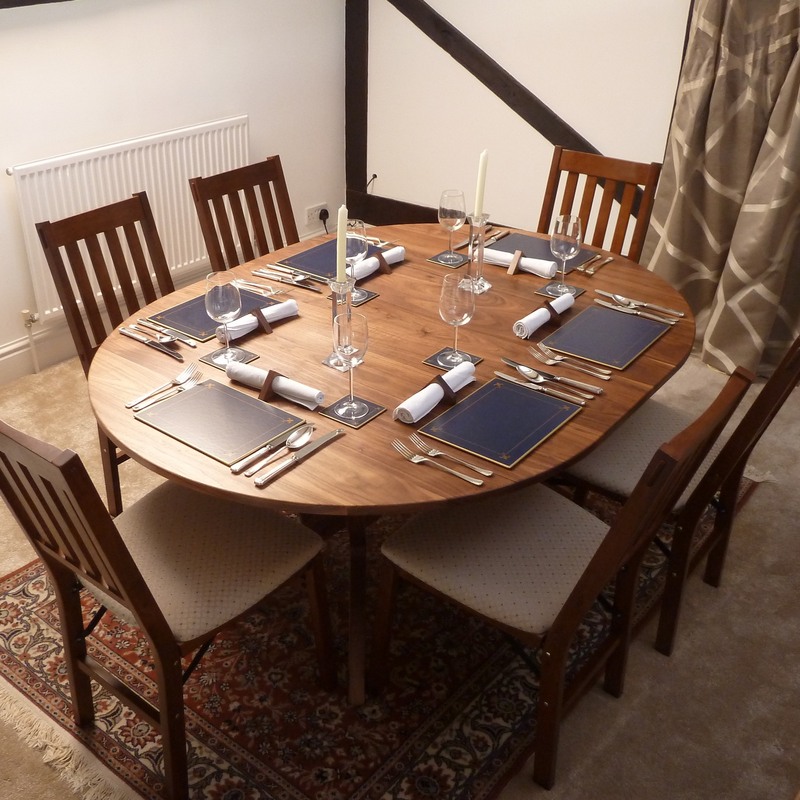 When they came across Irene’s butterfly leaf extending dining table, they immediately jumped at the idea of having a bespoke table made to cater for their specific needs. Irene discussed Dianne and Mark’s requirements with them and visited their home to see where the piece would be situated. 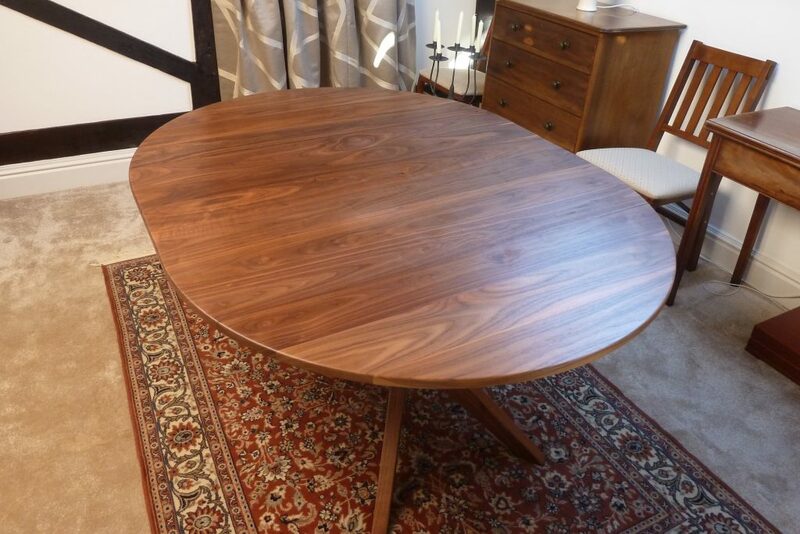 The requirements were quite unusual and fairly specific – the table needed to be suitable as a working desk with straight edges in one format and then able to open out into an oval dining table for 6/8 people in its other format. Having discussed the basics of the design and considered the table top sizes, leg arrangements and wood options, Irene provided an initial guideline price range. This enabled the clients to assess whether a bespoke table was a realistic option for them. Having decided that they definitely wanted to commission a table, the next stage was detailed design. Armed with information on the requirements for the table, Irene set about designing a bespoke arrangement to suit. Given the specific requirements, some adjustments were needed on initial sizes, to give a workable arrangement. Irene prepared a full-size paper template of the table top in its two formats so that Dianne and Mark could try this out in their room and be certain it was the right size and shape for their needs. The leaves then fold outwards and the table top rotates through 90 degrees, to change into the oval shaped ‘dining table’ format. 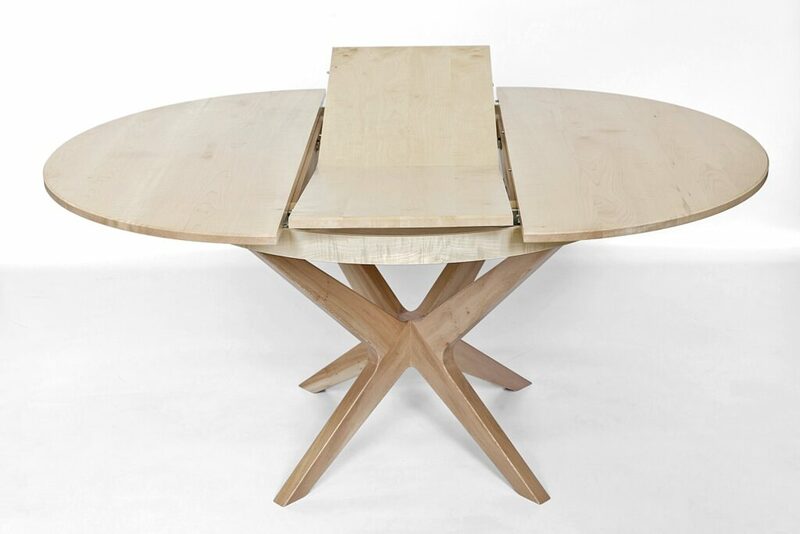 This short video shows how the table rotates between ‘working’ and ‘dining’ formats. The legs on the butterfly leaf dining table are specifically designed so that no-one is seated in front of a table leg, providing comfort for all diners. 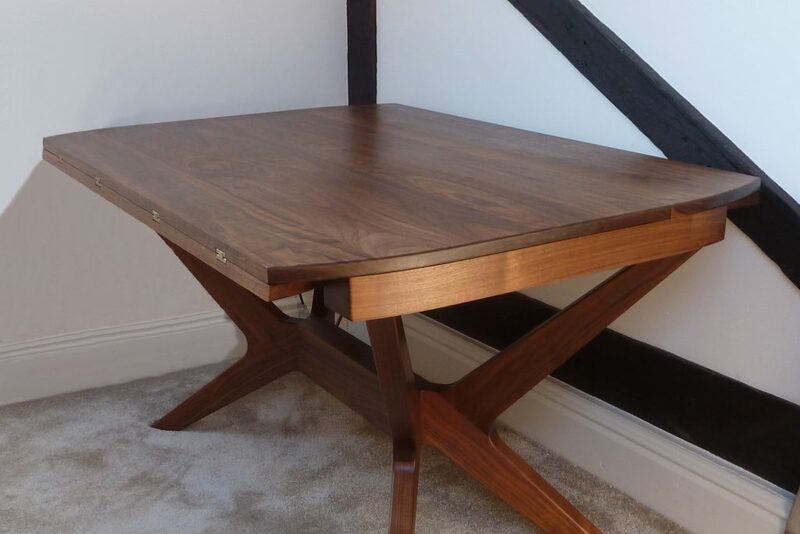 Having seen this, Dianne and Mark were very keen to have a similar leg design and Irene was able to incorporate this feature into their table. Once the design of the table was complete, wood type had to be finalised. Irene provided some samples of wood in the choices discussed. Walnut was decided upon as the best fit with their existing furniture and interior decor, whilst also being a beautiful looking wood in its own right. Having decided on design and wood type, Irene confirmed the final price for the table, a deposit was paid and the commission progressed to construction. During this phase there is not generally further discussion needed with the client, although regular updates will be provided with indication of progress. However, in this case the exact details of the mechanism for rotating the table still needed to be ironed out and in order to do this, Irene made a working mock-up of the proposed design. Dianne and Mark visited Irene’s workshop and were shown the mock-up and tried out the rotating table-top for themselves. They were happy with the mechanism and method of adapting the table between uses and so timber was purchased and construction of the real table commenced. Dianne and Mark were advised of progress as construction continued and once the table was completed, delivery was arranged. 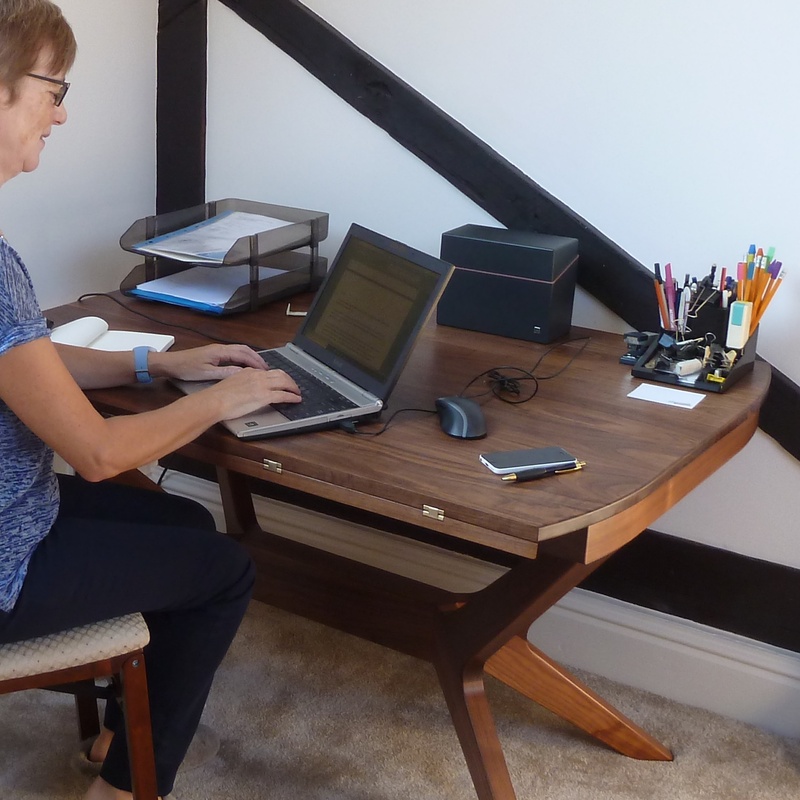 In this case, the table was to be located on a mezzanine floor reached by a spiral staircase and Dianne and Mark made special arrangements for delivery to tie in with some other furniture removals in the same room. The table was lifted into the room in its component parts by a removal firm and Irene then unpacked and assembled the table in its final position. Irene demonstrated the table adaptation from one format to another and they tested this out for themselves to be certain it was all easily adaptable.